Save The Peace Cross Documentary is a film about the Bladensburg WWI Memorial Cross also known as the Peace Cross. This documentary is about the Bladensburg WWI Memorial or Peace Cross that was dedicated in 1925 to honor 49 men who fought and died for our country but is in jeopardy of being removed due to a lawsuit filed in 2014 by the American Humanist Association (AHA) and 3 individuals. The AHA consists of Humanists and Atheists who do not believe in God and feel that the Peace Cross is a Christian symbol and infringes on their First Amendment rights so they want it removed regardless of it being a WWI memorial for 89 years. You will gain an understanding and knowledge of the Bladensburg WWI Memorial Cross or Peace Cross by watching “Save the Peace Cross Documentary” and appreciate its significance in order to support its continued existence. The 40 foot Cross was dedicated on July 12, 1925 by the local American Legion and the people of Prince Georges County to honor 49 residents who fought and died for our Freedom in WW1. They made the ultimate sacrifice for our country and for our freedom. The Cross is located on a small plot of land in a busy intersection where 3 major roads intersect. The roads are Bladensburg Rd, Annapolis Rd or Rt. 450 and Baltimore Ave or Rt. 1. For those who are not from around this area, Bladensburg Rd leads into Washington, Annapolis Rd goes all the way to Annapolis near the Naval Academy and Rt. 1 goes up the east coast. So this is a very heavily traveled road. Actually, Annapolis Road was constructed in 1925 the same year the Cross was dedicated and called Defense Hwy. The plot of land is now owned by the Maryland National Capital Park and Planning Commission but it was originally owned by the town of Bladensburg. The American Humanist Association along with 3 individuals – Steve Lowe, Fred Edwords and Bishop McNeill filed a lawsuit on February 25, 2014 against the Maryland National Capital Park and Planning Commission to have the Peace Cross removed. They are Humanist and Atheist who do not believe in God and feel that the Peace Cross is a Christian symbol which offends them. They want the Peace Cross removed because it is on land that is public and they feel they have the right to request it be removed since it is on land owned by the Maryland National Capital Park and Planning Commission. They have based this lawsuit on their First Amendment right which deals with freedom of speech, press, religion, assembly and petition. They believe it is unconstitutional for a sectarian religious symbol such as the Bladensburg Memorial Cross or Peace Cross to be displayed on public land. View the lawsuit at http://americanhumanist.org/system/storage/2/3f/0/5030/Bladensburg_Cross_-_Complaint.pdf. So The Big Question is: Is this a Religious Cross or a Memorial Cross? This documentary will answer that question! This documentary walks you through the history behind why the Peace Cross was built and why it was built where it is. It takes a detailed look at the Peace Cross including reviewing many of the lives of the 49 men who are honored on it. You will have a better understanding of the quotes and symbols found on the Peace Cross. The documentary will address the lawsuit in detail which includes interviews with the 3 plaintiffs, some of the key people who are defending the cross and the community. It will explain how the community used the First Amendment which deals with freedom of religion, speech, petition, assembly and press appropriately to defend the Peace Cross. Included in the documentary are several interviews from people who attended and organized ‘The Save the Peace Cross Demonstration’ that was held on May 31, 2014. The documentary will address what other consequences could occur to other monuments and memorials if the Plaintiffs win this lawsuit. As well as, review the process to qualify to be on the National Register of Historic Places. It will analyze the qualification in detail to assist in determining if the Peace Cross would qualify to be listed on the National Register of Historic Places in Prince George’s County, Maryland. For more information visit the Maryland Historical Trust at http://mht.maryland.gov/nationalregister.html. Now you will be able to determine for yourself if the Peace Cross is a religious cross or a memorial cross and whether it should stay or be removed. 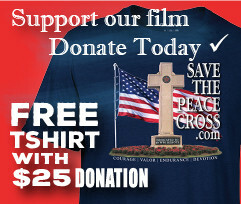 Thank you for your support and watching Save The Peace Cross Documentary!